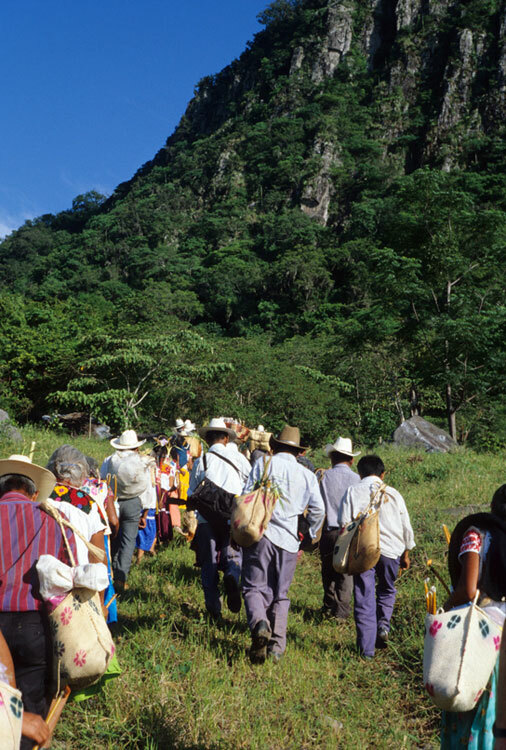 Many Nahua people today trace their ancestry to the ancient Aztecs. However, 500 years of sometimes violent history separates the 16th-century Mesoamericans from the modern people. This long time span makes it surprising that many beliefs and customs of the contemporary Nahua and other Native American groups today so closely resemble the descriptions recorded by Spanish chroniclers. One important feature shared by both the ancient and modern civilizations is a reverence for geographical features such as caves, mountains, lakes, springs, and rivers. The landscape itself is sacred, and it plays an important part in religious beliefs and rituals, then as well as now. For example, it is a common belief among today’s Nahua that powerful spirits live in specific locations throughout the countryside. Some may live at the peak of a certain mountain, or perhaps in a cleft in a rock where water flows from a spring. 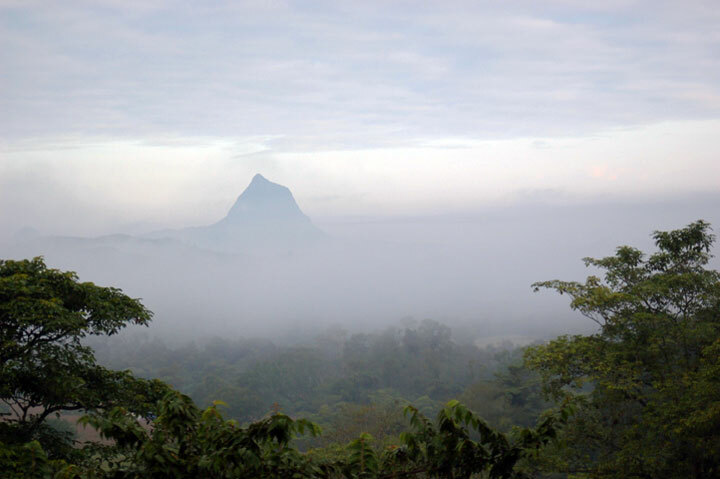 In order to win the favor of these spirits, people must periodically travel to these sacred sites and deliver gifts to the beings who reside there. 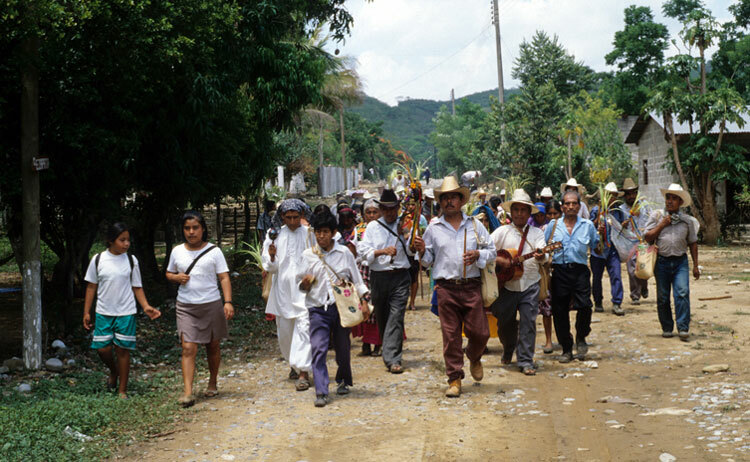 Because of these beliefs, both the ancient and modern people of Mesoamerica organize pilgrimages to visit the sacred locations in the regions where they live. 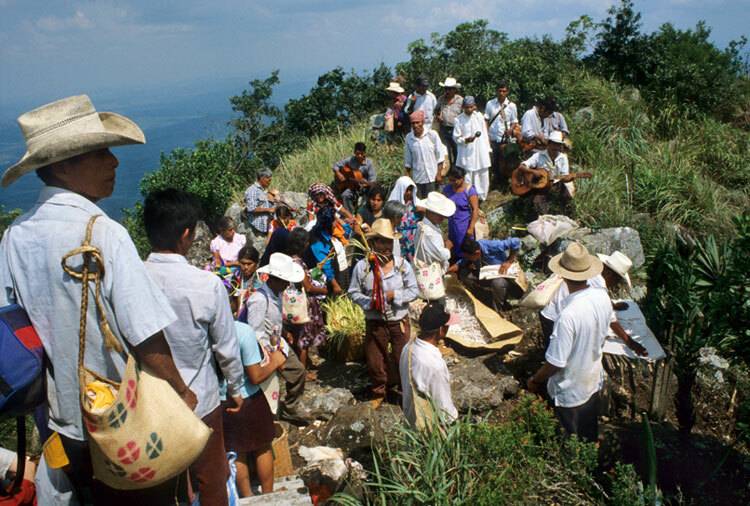 I would like to describe pilgrimages that the Nahua of northern Veracruz, Mexico, undertook in 1998 and 2001 to the most important sacred mountain in the region. This imposing land formation is called Postectli. It is a 2,000-foot-high rocky core of an ancient volcano located in the municipality of Chicontepec in the state of Veracruz. 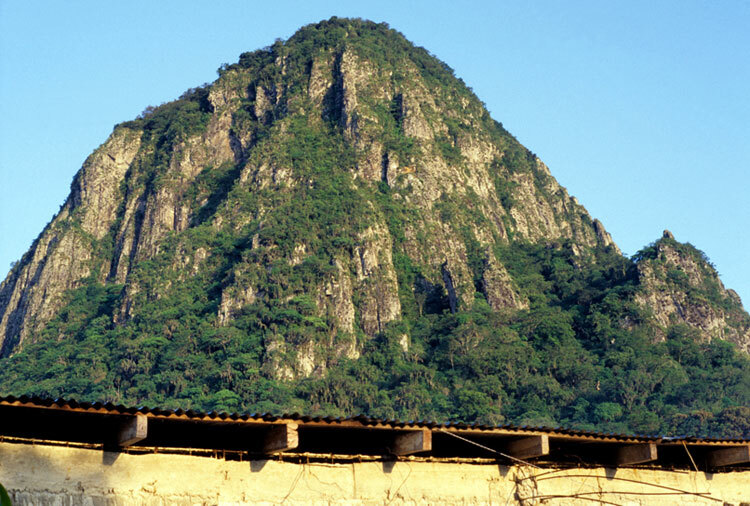 The name Postectli means “broken” because the mountain looks as if it was broken off at the top. The people say that at one time Postectli connected the heavens with the earth but that God became annoyed when ants crawled up and damaged his garden. He broke off the top of the mountain, and human beings and the gods have been separated ever since. Postectli is also the place where Seven Flower, the corn spirit, hid when people were trying to kill him. Thunder spirits broke open the mountain and freed him, thus restoring the gift of corn to human beings. 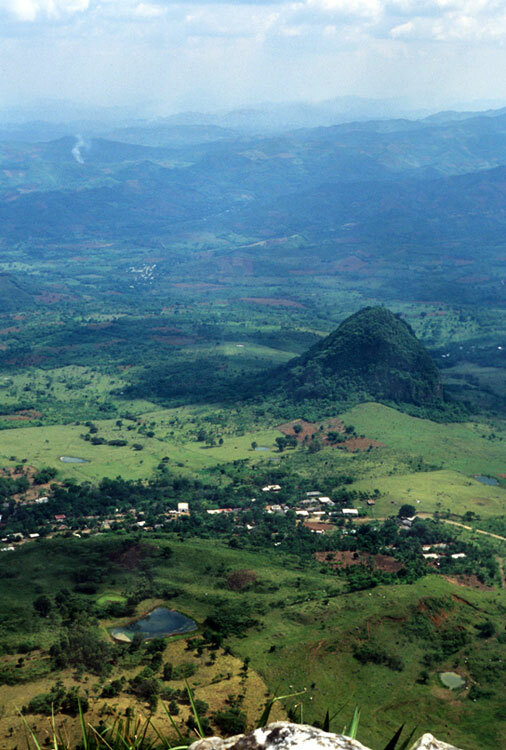 The mountain contains small caves near the summit that are said to be the homes of thunder spirits and Apanchanej, the Water Dweller. The spirits of the seeds that sustain human life live with her in the cave. This powerful female spirit controls the rain and sends it to the cornfields when the crops need to be nourished. Without Apanchanej, life would be impossible. She lives atop Postectli, but at the same time, she inhabits all bodies of water including springs and rivers. These are places the pilgrims visit, too. In myths, Apanchanej is sometimes portrayed as Tonantsij, “Our Sacred Mother,” who is recognized throughout Mexico as the Virgin of Guadalupe. Nahua pilgrimages are organized by a ritual specialist called a tlamatiquetl in the Nahuatl language. The word means “person of knowledge,” and anyone can aspire to become such a shaman-priest if they are willing to undergo the long grueling apprenticeship. 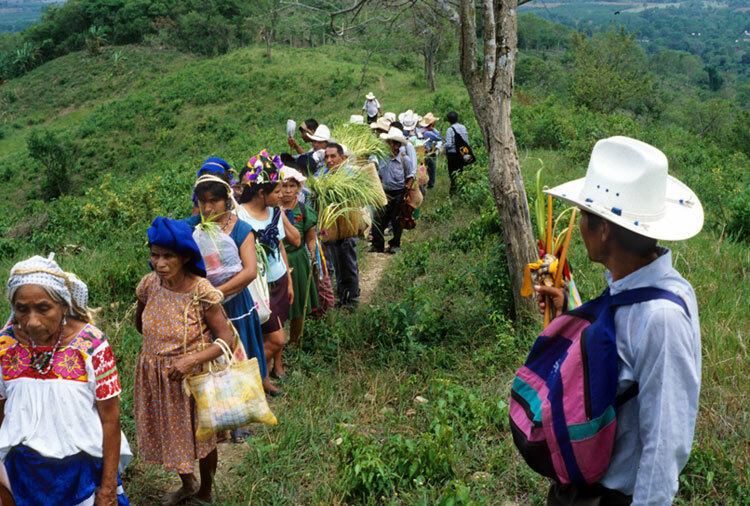 To organize a pilgrimage, a person of knowledge must first notify friends and helpers in his or her own village and in neighboring communities. The participants gather several days before the actual pilgrimage in order to prepare offerings and decorations for the altars. 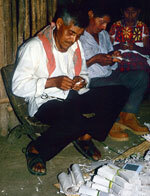 A typical pilgrimage requires the cutting of paper images of spirit beings. In addition to thousands of cut-paper spirits, the people also prepare huge numbers of floral adornments, and contribute sacrificial chickens and turkeys, bread, copal incense, alcohol, and many store-bought items such as crackers, cookies, and soft drinks to be used as offerings. 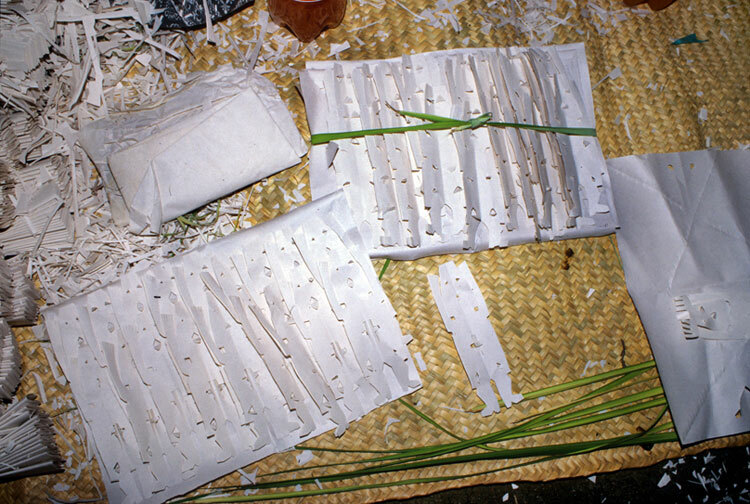 Dressed paper images of seed spirits that are kept all year in a special wooden box on the ritual specialist’s home altar must be carefully taken out, their tiny cloth outfits removed and washed, and the images dressed again before the pilgrimage can begin. 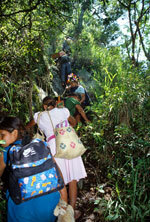 Nahua pilgrimages are complicated rituals involving many different activities. 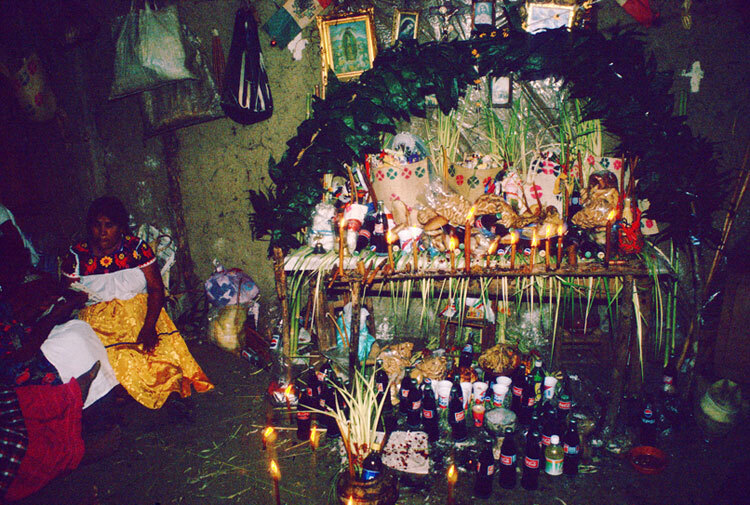 The most important features of pilgrimages involve the construction of elaborately decorated altars and the dedication of offerings to selected spirit beings that are related to crop abundance. Including all of the time spent preparing for it, a pilgrimage may last 10 days or longer. During a pilgrimage, the participants get very little sleep. 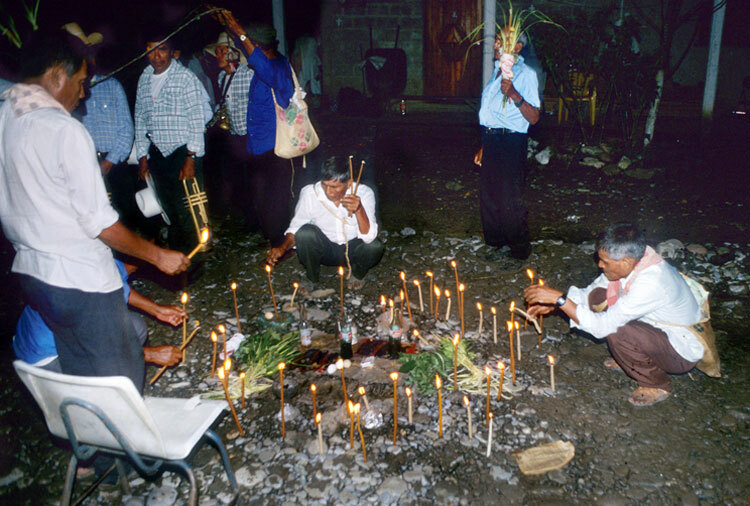 Once preparations are complete, the ritual specialists hold a cleansing ceremony in which they dedicate offerings to disease-causing wind spirits and dangerous figures who inhabit Mictlan, the Place of the Dead. Several times during the pilgrimage they repeat this cleansing ritual. It is designed to remove dangerous spirits who might be attracted by the beautiful altars, sacred guitar and violin music, and valuable offerings. Next, the participants lay out paper images on the main altar in the village shrine. 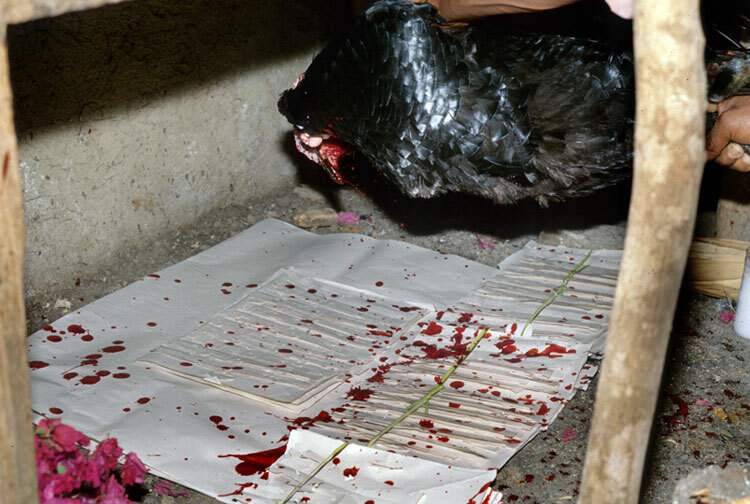 There the people sprinkle the blood of sacrificial chickens and turkeys on the paper as a special offering. Then the altar is decorated and offerings are placed all around. 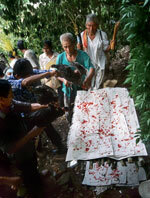 Smaller gifts are offered to Apanchanej at a nearby spring. After an all-night vigil, the participants load up the cut-paper images, decorations, and items to be offered and begin the 12-hour trek to the base of Postectli. They arrive in the late afternoon and immediately begin to decorate an altar at a shrine located at the base of the sacred mountain. After another night of sacred music and dances, the pilgrims load up again and begin the difficult, and often dangerous trek up Postectli. 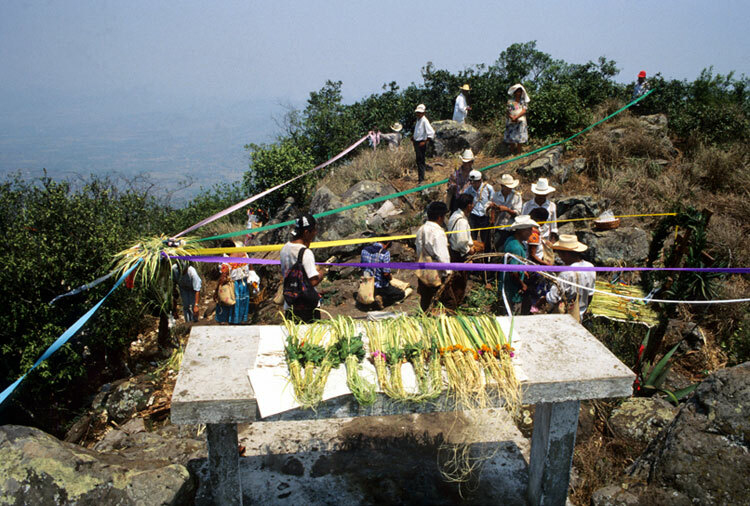 About one third of the way to the top, the people stop to rest and decorate an altar dedicated to the cloud spirits. After an hour or two, they resume their climb and stop again at a flat place about two-thirds of the way up. Here they decorate yet another altar to water. 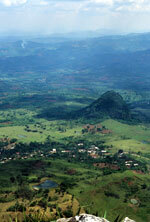 Nearby are two small clefts in the rock, said to be the homes of Apanchanej and her thunder spirit companions. It is from these openings that they send rain to the farmers’ fields far below. After thirty more minutes of climbing, the pilgrims make it to the peak of Postectli. Reaching the summit is the climax of all the effort and expense borne by the participants in the pilgrimage to Postectli. They arrive exhausted and rest for a while before constructing three more altars. They erect one altar to the hill, another to the moon, and most spectacularly of all, a circular platform altar dedicated to the sun. The view from the summit, surrounded by the beautiful altars and all of the people crowded around, is awe-inspiring. 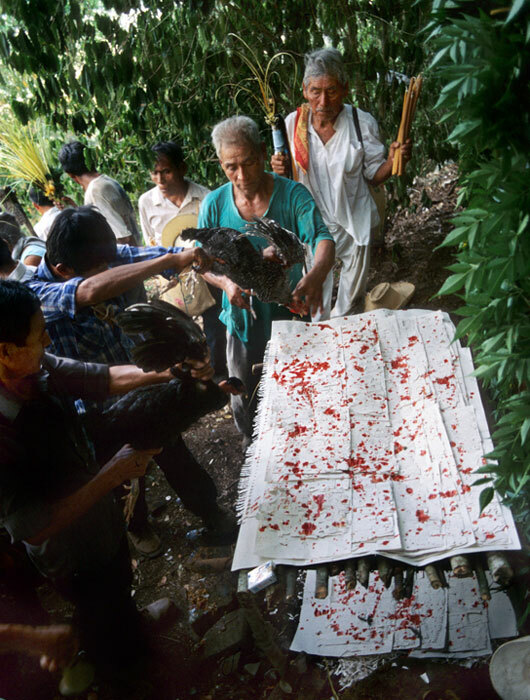 Nahua rituals are designed to create harmony with the spirit forces that surround them. The people accomplish this critical goal by dedicating gifts to the spirits and by sacrificing their sleep, time, wealth, and heart-felt effort, and thereby show their deep respect for the cosmos and all of its inhabitants. Even the dangerous underworld figures and disease-causing spirits receive their gifts of food, tobacco, drink, and flowers. The pilgrims wish to repay the beneficent spirits for past harvests, good fortune, and the beauty that exists in the world. By making offerings they demonstrate their commitment to keeping the cosmos in a well-balanced condition. In return for giving their respect and paying attention to the ritual practices, the people hope that the spirit forces will continue to provide the resources upon which life itself depends. 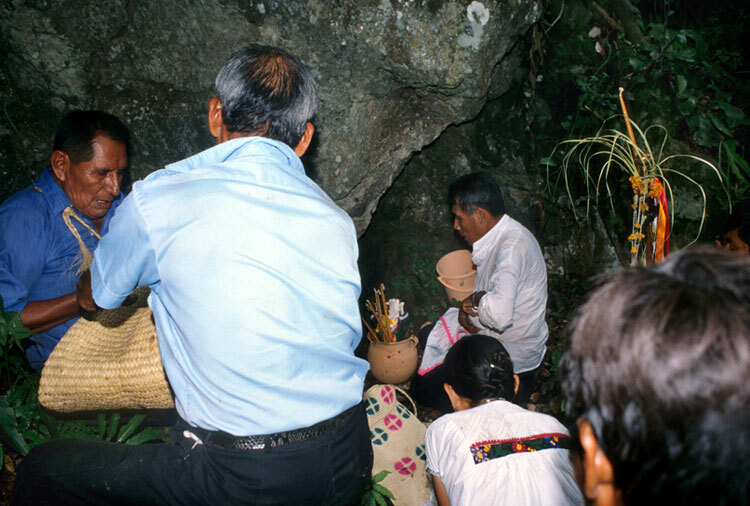 Nahua rituals are beautiful and attractive events that acknowledge the debts people owe to the spirits. When they express respect and gratitude, human beings encourage the flow of benefits that shower down from all corners of the cosmos.